How Great Wakering Primary School Honoured the Fallen and Remembered the Sacrifices of the Survivors from 1914 to 2014. The year 2014 is a time when the anniversary of the outbreak of World War 0ne is remembered and the ending of World War Two 70 years ago was celebrated. The staff and pupils of the school decided they should do something very special to commemorate this very special period in the life of this very special village. Not something to glorify war with bombs and bullets but to show the progress of the area achieved under exceptionally difficult times, to reflect the outstanding courage and fortitude of every man, woman, boy and girl as they made their way through life. It was decided to create a mosaic showing all these facets to adorn the outer wall of the school near the entrance. Funding was obtained from the Heritage Lottery Fund and professional help obtained. Work started and in the meantime research started into the life and times of local people who lived and worked through the years. This is how I came to be involved. My wonderful friend Hilary who really works more than tirelessly for the betterment of young lives in this area asked my help. Like most I have no personal recollection of WW1 but remember vividly the happenings of WW2. I was 4 years of age at the outbreak of this horrific war and lived and grew up in Little Wakering Road. I have lived and worked here ever since. I was able to provide the school with an account of boyhood memories of Barling and Wakering at this time. How there were few cars, everything was rationed and everyone had ration books, there were no street lights or road name plates, no lights were allowed to be seen at night. How we watched enemy bombers, doodlebugs and V2 rockets pass overhead going to bomb London and other cities only to be intercepted by iconic Spitfire and Hurricane fighter planes from Rochford, Hornchurch and Biggin Hill attack and destroy many who hurtled to earth in flames. Hilary and others put this information together and asked three other ladies and myself to call into the school one morning to answer questions from children. I had had no briefing and didn’t know what to expect. I have been to the school before on occasions and always held the school in high esteem but this morning I was simply blown away by the wonderful behaviour and demeanour of the children of Wakering. Their questions were so well thought out and put together, so well presented and recorded on microphones that I was totally overwhelmed and when I recall that morning it all comes back. A display was ma de in the school foyer which I am pleased I was able to help towards, with a few war time relics (apart from me). 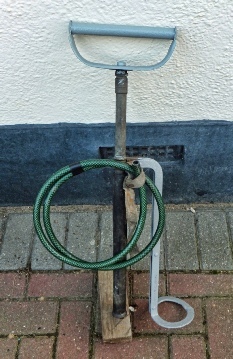 The photograph on the left is of a Stirrup Hand-pump. This was used to extinguish incendiary bombs which were capable of burning for up to ten minutes. The bombs consisted of a hollow body made from aluminium - magnesium alloy with a cast iron / steel nose and filled with thermite incendiary pellets. I was able to demonstrate to the children how Fire Guards would have used them at a safe distance of up to 30 feet away. It was the duty of a Fire Guard to take turns in watching for the fall of incendiary bombs and to help promptly control them and thus to prevent small fires from becoming big fires. The photograph on the right shows an actual hand grenade from WW2. 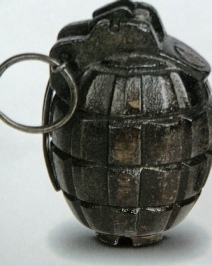 The safety pin and ring to pull it out can be clearly seen on the disarmed grenade with its distinctive pineapple skin which would have been packed with TNT. On a beautiful autumn morning, unveiling day came and I was honoured to be invited. We were treated to cakes and coffee from the school kitchen. A good crowd gathered with some invited guests. The Mosaic looked resplendent in the autumn sunshine, is very large about 25 feet long and 6 or 8 feet high. Unveiling was by one boy and one girl, again they stole my heart. They were so confident, so well poised and spoke with faultless clarity. They were a tribute to the school. The mayor of Southend had been invited and gave a moving and poignant address based on a theme, “We must never forget”. Other speeches followed. A wonderful day not to be forgotten, and as we remember armistice signed at the eleventh hour of the eleventh day of the eleventh month and remembrance Sunday when we remember the fallen and the wounded we must never forget. We must never forget the uncountable numbers of service people who gave their lives during World War One and of the vast numbers who were injured in body and mind. The people of Malta dubbed the nurse of the Mediterranean who was well placed to receive casualties from a wide area and provided 27 hospitals with 25 thousand beds. The people who died during World War Two and other conflicts, the 453 who gave their lives for freedom in Afghanistan and all those who returned with life changing wounds.